Reef Paradise Tablerunner, by C & F Enterprises. 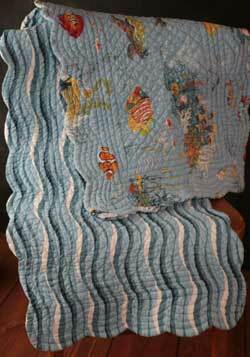 This double-sided quilted tablerunner features a wave pattern in blues on one side, and a colorful pattern of tropical fish on the other. Edges are scalloped. 100% cotton. Measures 14 x 51 inches.